Have you ever wondered about the growing up years of Albert Einstein, Benjamin Franklin, Marie Curie, and Stephen Hawking? Would it surprise you to learn that all these future scientists had regular kid-problems, such as bullies, arguments with their siblings, and homework? 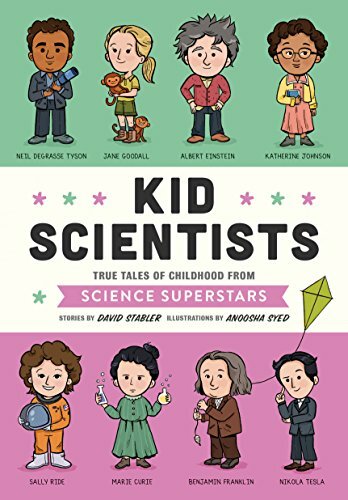 With its colorful and quirky cartoon illustrations and kid-friendly text, the author relates funny and true stories of 16 kid scientists whose original inventions and ground-breaking discoveries would change the world. Rich or poor, each kid developed an early interest in science. They were all encouraged by their parents. Each pursued their chosen careers in the midst of difficulties and disappointments. It was not always a smooth ride. Before these scientists became super scientists, they were driven by a special curiosity about the world around them. "Scientists begin by asking why, and then they find out how." It was a life changing event during childhood that set these kids on a path to their future careers. Mary Temple Grandin was born with autism, a brain disorder that affects communication, social behavior, and processing sensory information. At a young age, she discovered that she had a talent for inventing things. Her mother sent her to a special school where she was surrounded by horses and cows with emotional difficulties. "I see the world an awful lot like a cow," explains Temple Grandin, who became one of the world's best-known animal scientists. Vera Rubin loved gazing at the stars through a homemade telescope. She had a lifelong fascination with the stars and the speed at which the universe spins. She spent her whole life looking for answers to this question. "I became an astronomer by looking at the sky." Despite a lack of encouragement from her teachers, who scoffed at women scientists, she attained a degree in astronomy from Vassar. She developed the theory that galaxies and solar systems spin the same way. Sally Ride was so active that her parents had trouble containing her. She jumped out of her crib, got out of her car seat, and vaulted to the front seat beside her father, who was driving. She hated school because she was bored with the subjects that were taught. She excelled at sports and became a tennis champion. Eventually, it was science that sparked her interest, and she became the first woman to travel in outer space aboard the Challenger. "The hard-hitting tennis prodigy turned science geek had picked her path to excellence—and rode it all the way to the stars." Albert Einstein, considered the most creative scientific mind of the 20th century, began his life as a slow learner. But when his father gave him a compass, he was mesmerized by the needle and began to take an interest in magnetism. He studied these invisible forces for the rest of his life and went on to achieve the Nobel Prize in physics. "Wisdom, he once said, is not a product of schooling but of the lifelong attempt to acquire it." Rosalind Franklin excelled at puzzles, crosswords and word games. She had an extraordinary talent for numbers and loved math and science. She had a successful career as a biophysicist, at a time when universities were reluctant to accept women in their science programs. Her research eventually led to the discovery of DNA, the building blocks of life. "Even the greatest geniuses start out small." Stephen Hawking developed a passion for trains and building things. As a boy, he constructed model airplanes out of balsa wood. Later, he built a computer and programmed it to solve math problems. Despite a severe physical disability, his ground-breaking theories about black holes and the nature of gravity gave us a better understanding of the universe. Jane Goodall, best known for her work with chimpanzees, exasperated her mother by hiding live snails and worms under her pillow. Neil deGrasse Tyson was so mesmerized by his first visit to a planetarium that he felt that the universe was calling him to explore it. He earned the money for his first telescope by walking dogs. A funny and inspiring book for children and adults.